Tales from the river bank. – Dirty wet dog , boats and sailing. Tales from the river bank. 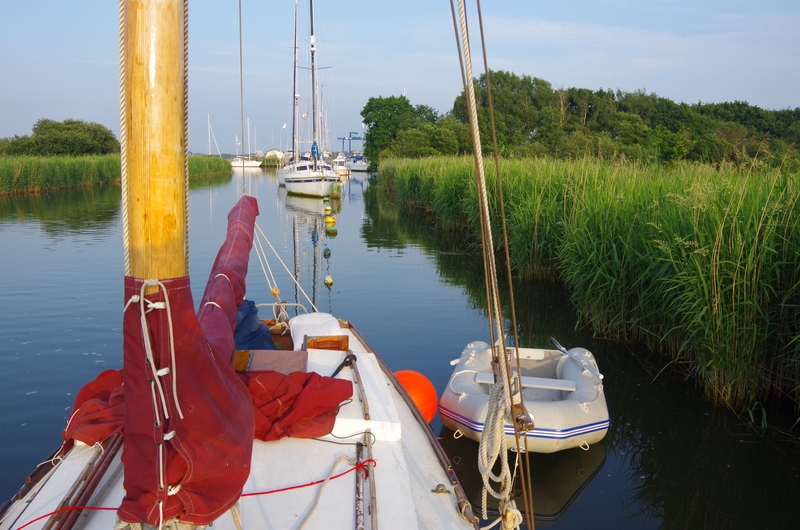 Picking up from where i left off with Inanda in the river Frome at Wareham. First though a bit of news : i have been waiting a while after seeing the orthopaedic consultant but i now have a date for surgery so in exactly 4 weeks from this post going out i will be having a knee replacement. I’m actually happy about that because the knee seems to be deteriorating quickly and totally crapped out on me just before the next stage of the trip such that i didn’t think i would be ok to be scrambling around the deck of a small sailing boat in brisk conditions off Portland bill. Wareham, and specifically Ridge Wharfe boatyard was a good place to leave Inanda for a few weeks as she could stay on a very sheltered line mooring in the river and then when i did manage to get back there they were able to get the mast out one day and back in the next after a very quick days work on the rig. In days past i would have done the rig inspection and the jobs that i knew did need doing just by going aloft myself . Inanda has a tiny rig compared to being a hundred feet up on a maxi-boat rig but without having inspected anything first i wouldn’t trust any halyard, block or shackle to hang my weight off. I could get aloft but equally she doesn’t have any winches to wrap a line around….not so much for heaving me up, i do all the climbing…..but for lowering me off again. Having the rig on the ground meant that i could see what was needed and drive around to Poole to get stuff from the chandlery’s too. Rig about to come out. Doing the work, mainly blocks, halyards and all the mousing. I did also do a very quick surface repair in a couple of places where the edge of the gaff saddle has chewed the wood a bit. The epoxy was all-but going off as i mixed it ! The good news is that the mast itself is in good condition. What it needs long-term is some epoxy and glass patches to protect the points where the gaff saddle chafes on the wood. My plan would be to have an anti-chafe patch at each reef (hoist) point and then a half-circumference glass strip over that for the saddle to run on. Back in and re tuning the rig. My set-up for the next section of the trip home is to raise the gooseneck height by moving the mast band up 4 inches and permanently setting the mains’l at the first reef. With the mast raked back a bit to get the shroud and forestay tensions better that extra height at the gooseneck gets the boom out of my face in the cockpit….its still low, in fact too low but not stupid-low as it was with the modified mains’l. Again and long term the mains’l needs to be cut to different proportions with more hoist at the mast and less length on the gaff and the boom. I did also take the outer forestay (jibstay) off as it does very little and removing it might allow the WM to work better. Back in and setting-up again. Back on the river mooring. The pollen off the wild grass right next to the boat was ferocious. The whole area is covered in grass meadow so me and the rigger both suffered with hayfever while i was there. The mooring in the river is only feet from the bank, on some combinations of wind and tide Inanda was solidly in the mud and almost high and dry but sitting near upright with her long keel in the mud. There was a rickety stage landing through the reeds at each mooring point but the one next to Inanda felt a little bit ‘soft’ with me on it. The last night on the river before heading out into Poole harbour to try and escape the pollen. Lovely spot on the Frome there Steve, apart from the pollen! Good news about the knee — hope it all goes well. Hi are you by any chance the Steve I met up at calstock boat yard a couple of weeks ago?